Written by Catherine Saxelby on Wednesday, 06 May 2015. The Low GI Diet won't eliminate all your carbs but it does make you think about choosing ‘smart carbs' to help your weight loss efforts. Legumes, pasta, grainy breads and the right types of cereal, rice and snacks are preferred over white bread and refined cereals. It's based on the Glycaemic Index (GI) concept which says that low GI carbs are digested and absorbed much more slowly and so last longer in your system. It was originally a concept for diabetes but now has advantages for dieters too. "The 12-week plan for weight loss, good health and wellbeing"
"Scientifically proven, nutritionally balanced, effective and healthy way to start losing weight and improving your overall health - today!" The book promises that you'll feel fuller for longer and less inclined to snack between meals, that you'll reduce weight at a faster rate than a low fat diet, decrease your body fat (not muscle or water) and lower your glucose and insulin levels over the day. Written by the professional team of internationally-recognised researcher, Australian scientist Professor Jennie Brand-Miller who is also a dietitian and fitness leader, this book is a practical and balanced diet plan that also embraces the ‘good fats', lean protein and moderate sugar. Sugar is not banned but incorporated into snacks and dessert recipes in small quantities. Overall the diet is healthy and easy to follow. There's no need for special meals as the whole family can eat these meals. After 12 weeks on the diet, you move to their ‘Doing it for Life' weight maintenance plan to reduce the chance of regaining what you've just lost. It's full of good, practical advice on portion size, eating out, stress eating, regular exercise and helping overweight kids. There are 12 weeks of menus as part of an Action Plan that includes a food goal, exercises, activity goal and a Food for Thought idea. Here is Monday's menu from Week 1. Baked white fish fillets with chopped parsley. Serve with chopped spinach and lemon, yellow squash, carrots and a couple of baby new potatoes. 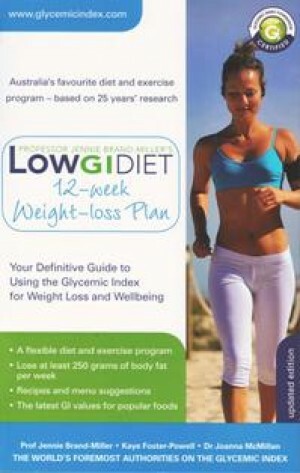 The Low GI Diet Weight Loss Plan by Jennie Brand-Miller, Kay Foster-Powell & Joanna Mcmillan (Hachette 2011). What do GI and GL mean and what’s the difference between them? Q. Is it true that vinegar makes a meal low in GI?